What role has genealogy played in your connection to Chassidus? My family's Chassidic connection took me by surprise in 1993, after I had begun to attach myself to Breslov on my own. Moishe Miller, a cousin we had never heard of, was working on a massive Miller genealogy database and contacted my father for more information. I later spoke to Moishe, too, and spent a Shabbos with him and his father (also Bob Miller!) in Flatbush. 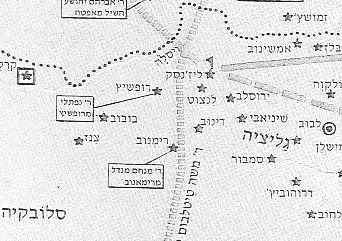 Moishe's research showed that our particular Millers were descended from an older brother of the B'nai Yissaschar ZY"A, named Avraham Abba (or Aba), who at one point took the surname Miller. Much of Moishe's work, really the tip of the iceberg, can be found here online. Links from this web page can be followed to later generations. At any rate, our Miller family became Sanzer chassidim in the mid-1800's, living in Galicia (that is , Southern Poland) in and around Sanz (Nowy Sacz) and Gorlitz (Gorlice), and just across the Carpathian mountains in Hungary (now Slovakia). Our immediate family moved from Bardejov to the US in stages, around 1900. See the listing for Simon (Shabsi Yitzchak) Miller on on this page. This connection was all new to me and to my father. At that point, I began learning more about the B'nai Yissaschar and about the associations of our very extended family in Eastern Europe, including Sanz, Dzikov (Yitzchak Birnbaum, a great-grandfather I'm named after), Bobov, Munkacs, Dinov, Bluzhov, etc. I'm by no means an insider, but I've learned a bit about these groups' approaches to Yiddishkeit. By the way, from a number of their writings that I have, I can see that their Rebbeim have held Rebbe Nachman of Breslov ZY"A in high regard. I'm told (by Moishe) that I have some distant Chassidic cousins in Borough Park, including the cantor Benzion Miller, but I have not met them yet. According to your understanding, what makes the approach of Sanzer Chassidus unique? Also, has the knowledge of your roots caused you to adopt any specific regional minhagim, or to begin learning Divrei Chaim? The Sanzer Rav ZY"A, as I understand it, said it was time in his day to re-emphasize the ideal of high-level Torah scholarship within Chassidus and to place somewhat less emphasis on the mystical component, which was still by no means lacking. I bought a copy of the one-volume edition of Divrei Chaim on the Torah and Moadim (published by Mishor). This edition includes a later work, Totz'os Chaim at the back that shows source references for the sefer. A subscriber list in this work includes some of my family members. I also found a more recent book, Mishnas HaDivrei Chaim al HaTorah, that clarifies some passages in the Torah commentary and provides additional source references. I could really use a detailed overview or study guide in English, but very little Sanzer material other than biographical/historical seems to exist in English. I've also bought a number of works by and about the Rav and his descendants, the Rebbeim of Shinova, Gorlitz, Klausenburg, Bobov, Stropkov, etc., including the Klausenburger Rebbe ZY"A's recently published lectures on the weekly Parsha. Again here, there is very little published material, original or in translation, in English. I really enjoy the Ropshitz /Sanz/ Dzikov/Bobov nigunim, which frequently pop into my head. I use the well-known Ropshitzer nigun for the zemer Menucha v'Simcha. We have also donated from time to time to Sanz-associated causes in Israel like Sanz Laniado Hospital and Kollel Chibas Yerushalayim. I too have done a lot of genealogical research into my family, see here. I have also come into contact with Moishe Miller. What great information. Beautiful post, Bob. I suspect that every Jew has a great family history lurking behind him or her. As a people we've been through so much upheaval that much family information has become very hard to access. As a small example, my father's parents kept a lot of family memorabilia in their attic, but (what proved to be) an antisemitic tenant family renting the upstairs apartment in their two-family house once tossed it all. This whole genealogy awareness leaves me with mixed feelings. On the one hand, I much know better where I fit into Jewish history. On the other hand, my accomplishments so far have fallen far short of my potential, so I have little to boast about. Maybe all this info came to light as a necessary incentive for self-improvement. Bob Miller - Yes, finding information is often close to impossible. Especially if relatives claim they know nothing about family history except names here and there. As you said, Tzanz had a point to deemphasize mystical aspects of chasidus. I believe Tzanzer Rov was one of the early figures who said "nishkahas Toyras haBaal Shem Tov". Great post. In case you're not aware, the grandmother of the Bnei Yisaschor (and of course your zeide) was a sister of the Rebbes, Reb Elimelech of Lizhensk and Reb Zusia of Anipoli. Also, you commented: "On the other hand, my accomplishments so far have fallen far short of my potential, so I have little to boast about. Maybe all this info came to light as a necessary incentive for self-improvement." That is exactly what yichus is for. You are using it exactly how the Ropshitzer said it should be used. I wrote about that here . What individual, if any, was ever accurately quoted as saying "nishkahas Toyras haBaal Shem Tov"? "nishkahas Toyras haBaal Shem Tov"
This doesn't apply to Breslov as Rebbe Nachman said "My fire will burn until Moshiach comes". Perhaps it does mean that many have forgotten Toyra Baal shem for what it's really supposed to be and think by outwardly acting pious they are yoitza without internalizing what the Baal Shem taught. The Baal Shem told Reb Pinchos Koritzer: "if one really has the trait of Emes than he doesn't need my Torah." dont mean to get off subject but I couldnt help it. Bob Miller: As far as I know it was said by the Kopuster Rebe in his "Mogen Ovoys". (Chabad didn't like it though). This phrase was later quoted by in "Vayoel Moyshe". Something similar can be found in Chayey Moharan. However it is a pretty involved subject and requires lot's of explanations. (Kopuster Rebe was a grandson of the Tzemach Tzedek). http://www.levlalev.org/ is a great Tzanz-Klausenberg tzedakah. It is a girls orphanage. I encourage everyone to sign up for a regular automatic withdrawl, even if it's only a little. I purchased Divrei Chaim al HaTorah in Yerushalayim IHK and was told by a Chassidishe Rav that it is very difficult learning. The few pieces that I learned through with a fine young Talmid Chacham was excellent though.